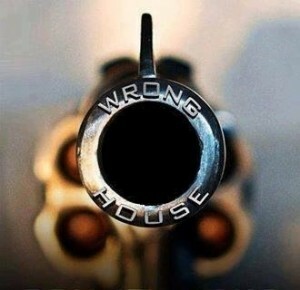 A bit of Photoshop bravado, but would it do any harm to have such an engraving on your primary self defense arm? Kinda sorta. Lots of people will say that, should one be forced to defend lives against violent criminal attack, there is a good chance of being sued by the family of the guilty. All it takes for an ambulance-chasing lawyer to ruin your life and take all you own is to get the jury to feel mad or uncomfortable about the person who had to pull the trigger. Outright expressions of confidence, let alone aggression, will go a long way towards convincing the jury that it is reasonable for the judge to award half of every paycheck you will ever earn to the aggrieved. Let me put it another way. It might say “WRONG HOUSE” on the muzzle, but you won’t be able to afford anything but a cardboard box behind the convenience store after the jury gets a gander at your gat. My take on it is a bit more immediate. It takes money to get a gun engraved, money that can be spent on the ammunition and range time needed to become a better shooter. 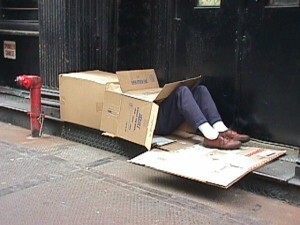 Why waste it on something that won’t help you survive an emergency situation? If that argument doesn’t have any weight, then consider this. After you are forced to defend, the police will confiscate your gun. After all, it is evidence! That means the gun you spent extra money to bling up will be sitting in an evidence locker somewhere, uncleaned and rusting away, until after the trial is over and the judge hands down a decision. If the criminal skips bail and the trial is postponed until he is caught, this might take decades. Any extra money you spent on the gun will be a waste if this happens. Good post. It is probably a good idea to watch what you write online as well. i get so tired of people spending money on BBQ guns with chest-thumping BS on their guns (and on gun forums). usually the people attracted to that kind of crap don’t actually shoot that much and are too busy investing their ego’s in guns/gear. life isn’t all about prepping for disaster and defense but the punisher emblems, skulls, etc festooning guns tend to point toward a person that plays too much Call Of Duty rather than being an actual BAMF. I’m blinging-up a Mossberg, but what the heck there’s a limited amount of what-to-do with it… Happy Thanksgiving!